What Balloon Decorating Topic Interests YOU Most? Welcome to our "Balloony News" May Issue. In some parts of the World, Mother's Day is already over (sorry Folks in the UK and Ireland, this reminder comes too late for you ...). However, if you live in the US, Australia, Canada, Germany or about 65 other countries from Anguilla to Zimbabwe, you have a good chance to surprise your Mom with a special gift this year. For you, this year's Mother's Day comes up on the 10th of May (the second Sunday in May). This 18" big balloon bouquet comes with six Mother's Days mylar balloons, four red silk roses & shiny ribbons. As the balloons are air filled, it will bring looooooong lasting joy to your Mom. You'll get FREE SHIPPING within continental US, for a price of US$ 59.99. For shipping costs to other destinations, please use the shipping cost calculator on the page. 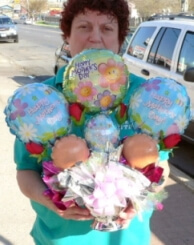 Nice add-on: the seller features a little video with information about the Balloon Bouquet. 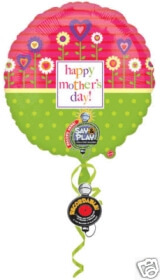 But even without a recording this 32" floating jumbo mylar balloon sends an impressive "I love you Mom" message. Price: US$ 13.99 plus shipping. 2. What Balloon Decorating Topic Interests YOU most? Today I need your help. I am planning to write an eBook about balloon decorating, but can't decide what topic would be best. Rather than guessing or consulting a fortune teller, I thought I simply ask YOU, my reader: "What Balloon Decorating Topic Interests You most?" Please take a minute to vote for YOUR favourite topic. The first 10 voters will get a FREE copy of the eBook, once it's done. Balloon decorating kits can be a great time and money saver AND produce a stunning decor for your party ... if you know which ones to choose. Our reviews of the most common types of balloon kits will help you find your perfect kit-fit for each event. Ranging from basic balloon centerpieces to star shaped walk through arches, there are balloon decoration kits for every taste and budget. Have a look through our reviews and editor's picks to see for yourself.